This CD features highlights from a four-night series of performances presented at The Kitchen, May 16-19, 1977. This CD was co-produced by The Kitchen and Orange Mountain Music. The Mary Flager Cary Charitable Trust and a grant from the Recording Academy have provided partial funding for this project. Legal services provided by Fried, Frank, Harris, Shriver & Jacobson LLP. We would like to extend our thanks to: Philip Glass, Kurt Munkacsi, Elise Bernhardt, Howard Stoker, Karen Kelly, Art Shifrin, Lanka Tattersall, New Art Trust, Bay Area Video Coalition, and Christopher Eamon. Photo: "Pendulum Music" performed on May 27, 1969 from "An Evening of Music by Steve Reich" as part of the exhibition "Anti-Illusion: Procedures/Materials" at the Whitney Museum of American Art, New York. 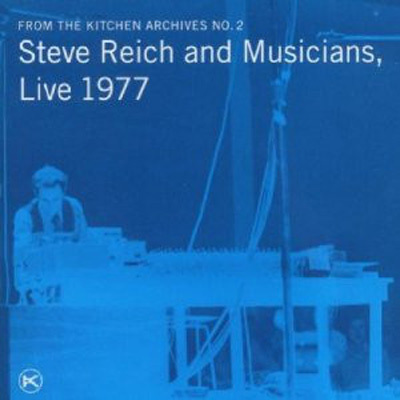 Performers pictures, front cover: Steve Reich; back cover: Richard Serra and James Tenney; inside liner notes: Bruce Nauman and Michael Snow.